MAN #1 (to Man #2): I’m rolling gutter balls, but I’ll bet I can still score! WOMAN WITH BOWLING BALL: I’ll take that bet! …he had to be a little special! Not the “Come-on-strong” type, but rather a bit hard-to-get …or at least get rather hard. Sadly, Ann’s love life was rather like a bowling alley: a lot of balls ended up in the gutter and at the end of the night, a bald guy with hairy ears had to spray the inside of her shoes with disinfectant. Don’t get Ann angry! You wouldn’t like Ann when she’s angry! 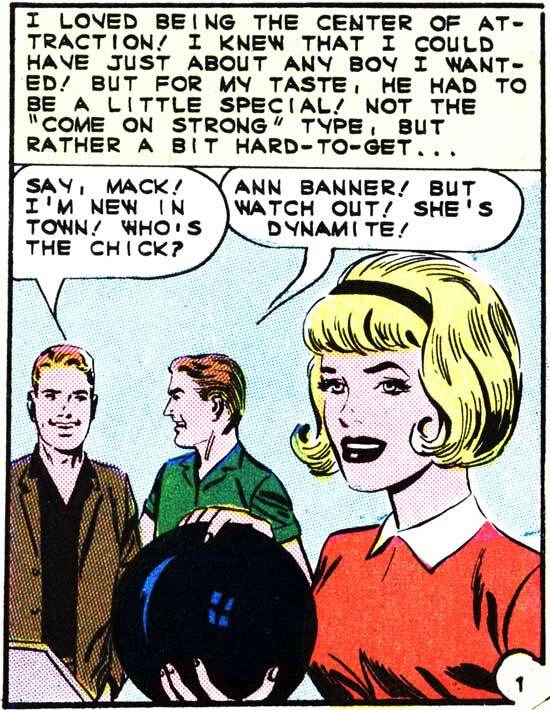 Because Ann Banner is…The Incredible Sulk!